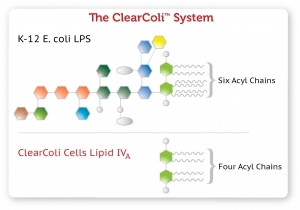 ClearColi competent cells have a genetically modified lipopolysacchride (LPS) that does not cause an endotoxic response in human cells. This was accomplished by blocking the production of LPS from the precursor lipid IVA through the incorporation of seven genetic deletions (ΔgutQ ΔkdsD ΔlpxL ΔlpxM ΔpagP ΔlpxP ΔeptA). One additional compensating mutation (msbA148) enables viability in the presence of lipid IVA. 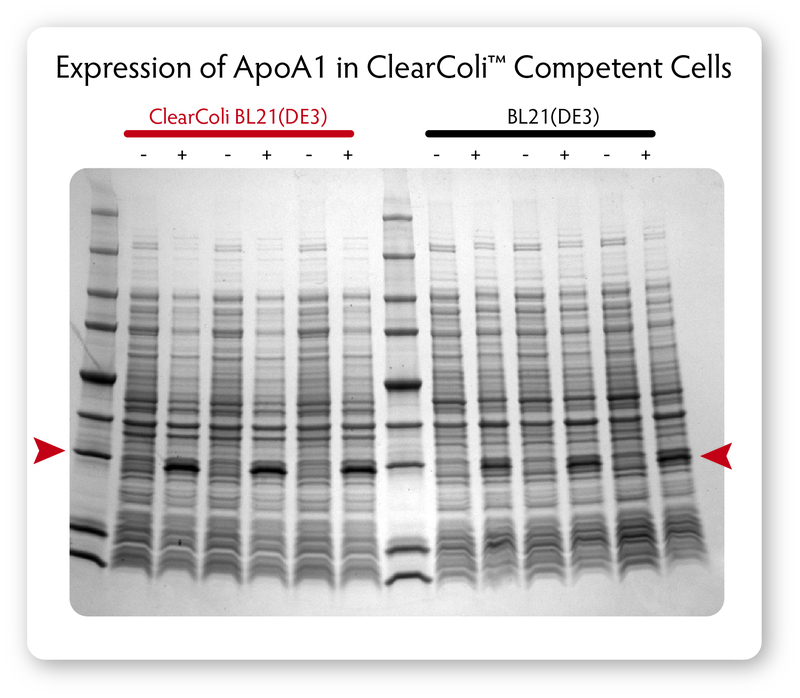 In ClearColi cells, the two secondary acyl chains of the normally hexa-acylated LPS are deleted. These deleted acyl chair are, a key determinant of endotoxicity in eukaryotic cells. The six acyl chains of the LPS are the trigger which is recognized by the Toll like receptor 4 (TLR4) in complex with myeloid differentiation factor 2 (MD-2), causing activation of NF-κB and production of pro-inflammatory cytokines. The deletion of the two secondary acyl chains results in lipid IVA, which does not induce formation of the activated heterotetrameric hTLR4/MD-2 complex and thus does not trigger the endotoxic response. In addition, in ClearColi the oligosaccharide chain is deleted, making it easier to remove the resulting lipid IVA from any downstream product (see Figure 1). 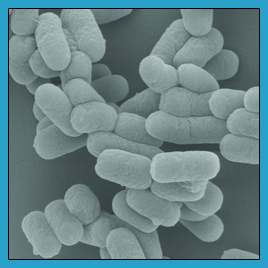 ClearColi Competent cells are subject to US Patent 8,303,964 and other US and foreign pending patents. 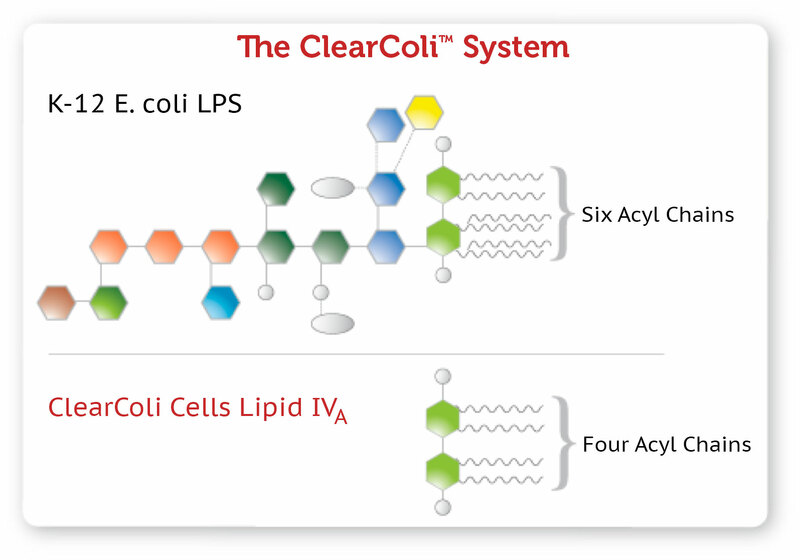 Figure 1 – Structure comparison of normal LPS from K-12 E. coli vs. lipid IVA from ClearColi cells. 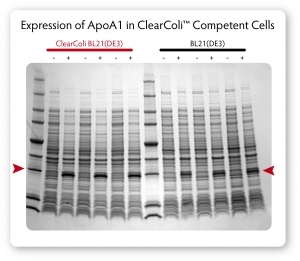 ApoA1 protein expressed from a T7-promoter based plasmid in normal BL21(DE3) and ClearColi BL21(DE3) cells was purified on, a simple IMAC-column without any subsequent endotoxin removal steps. The purified proteins were then tested for Toll Like Receptor (TLR) stimulation by assessing NF-κB activation in HEK-Blue™-4 cells expressing human TLR4. 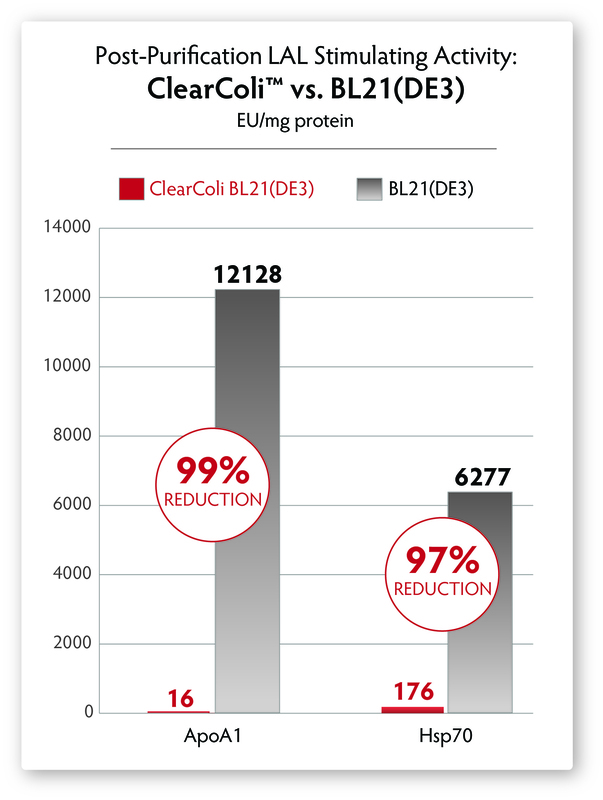 Protein derived from ClearColi BL21(DE3) cells demonstrated no activation at concentrations 4 orders of magnitude greater than the protein from traditional BL21(DE3) cells (see Figure 3). Fig. 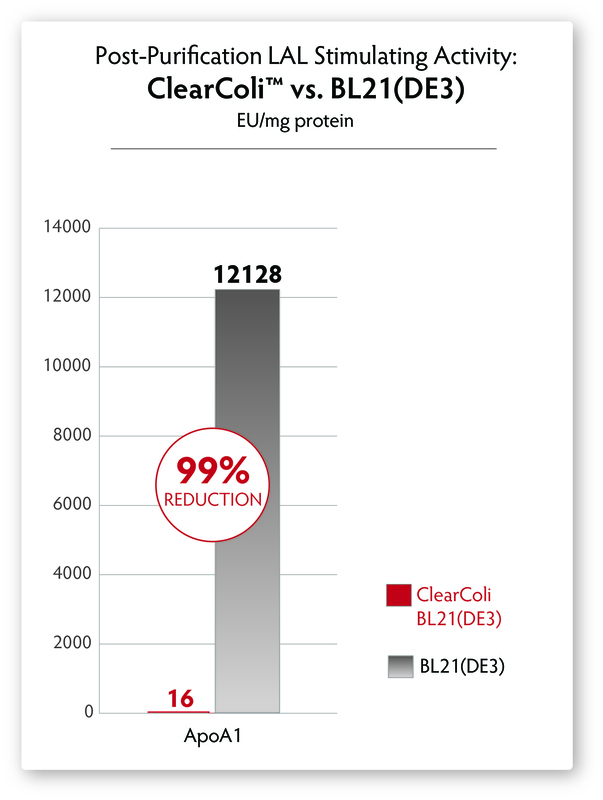 3 – Comparison of endotoxic response from protein derived from ClearColi BL21(DE3) and traditional BL21(DE3) competent cells. Limulus amebocyte assay (LAL) testing is an FDA-approved method for detection of endotoxins and the most common assay used; however the positive signal in the LAL assay is produced solely by the 4´-monophosphoryldiglucosamine backbone of LPS. LAL activity is minimally influenced by acylation pattern of LPS, the key determinant of endotoxicity in eukaryotic cells. The LAL assay also recognizes a wider spectrum of LPS/lipid A variants than the central cellular endotoxin sensor system of the human immune cell system. As such, false positive results in the LAL assay can and will appear due to the lack of specificity of the assay. 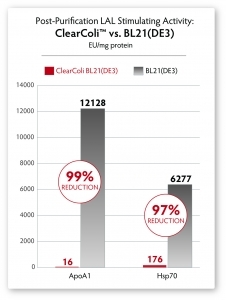 A simple Ni-column purification step for proteins produced from ClearColi cells will reduce LAL response levels by 95% or greater (see Figure 4). However, the residual endotoxin unit (EU) measurements due to the non-specific nature of the assay will remain unless extraneous LPS contamination from other sources is removed. 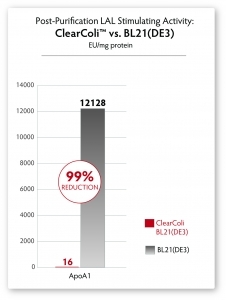 Alternative toxicity assays, such as those using HEK-Blue™-4 cells (see Figure 3) suggest that even in the presence of EU levels above threshholds normally targeted by researchers, ClearColi-derived proteins are rarely immunogenic. Due to the non-specificity of the LAL assay when combined with lipid IVA from ClearColi, it is suggested that researchers consider alternative methods of endotoxin measurement.